Hippocras is a kind of spiced wine. As Paul Lukacs writes in his book Inventing Wine, wine drinkers at all levels of society in medieval and early modern Europe drank spiced wines, “Spices not only would disguise a wine beginning to turn bad but also could make an otherwise dry wine taste somewhat sweet. And medieval men and women craved sweets. 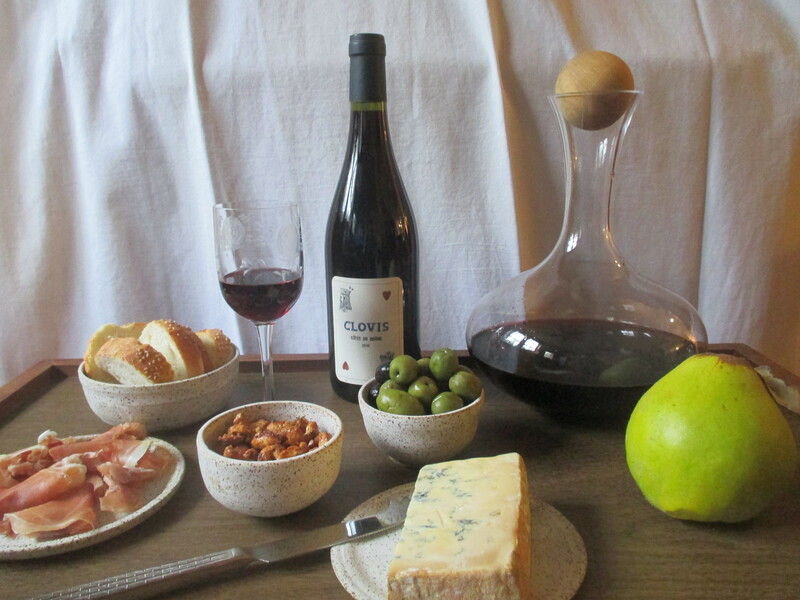 They used cloves, cinnamon, honey, and the like to season” their wines and their foods (43). Wines made before the invention of modern bottling technologies were highly perishable and markedly different from the wines we drink today. According to Lukacs, some were made from raisins and fermented to be sweeter and almost syrupy in texture, others were thin and sour depending on age and style. Fresh from harvest in the autumn, cloudy and fragrant wines were shipped in huge volumes from France, Italy, Germany, and later Spain to wine-consuming countries such as England which did not (at that time) have a local wine industry of its own. Adding spices to these wines as they aged made them more palatable and also added health benefits from the spices themselves. After the wine was infused with spices and sweetener, but before it was served, it was strained through a linen “hippocras bag” to remove the spices and other flavoring. This linen bag was named after Hippocrates, the ancient physician who advised the consumption of spiced wine drinks and was thought to have strained them through his voluminous sleeves. I’m excited about this post because I developed a hippocras recipe that I think is truly delicious and I learned a lot along the way. After many hours in the reading room at the UPenn library and many more hours clicking through digital images of manuscripts and printed books online looking for Hippocras (or its variant spellings Ipocras , Ypocras, Hypocrass, Hippocris, and Hipocras), I decided to prepare a recipe “To make Ipocras” from Robert May’s The accomplisht cook, a very popular cookbook that was first published in London in 1660. I’ve been thinking about May quite a bit over the last six months and I updated another recipe from this cookbook for the upcoming exhibition at the Folger Shakespeare Library, First Chefs: Fame and Foodways from Britain to the Americas. (Stay tuned for that recipe!) May’s Ipocras recipe beautifully seasons the wine without eradicating the original flavors. 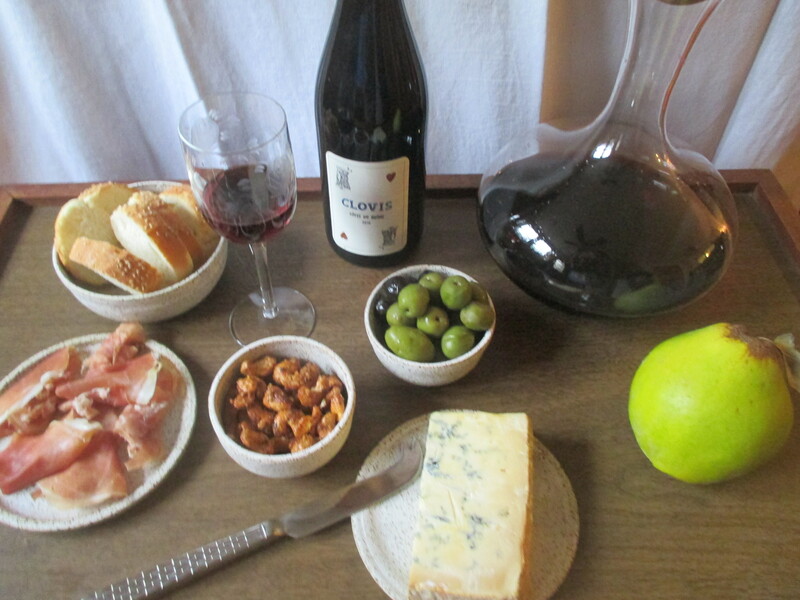 This was especially important to me because I was using a wonderful 2016 Côtes du Rhône made by Clovis thanks to T. Edward Wines. The wine is delicious on its own and I knew, with proper care, it would make a delicious hippocras as well. Below, you will find May’s recipe, my updated version of it, and quite a few hippocras recipes from manuscripts at the Folger Shakespeare Library, Clark Library, and UPenn Library. These recipes showcase a range of methods and I’ve including images and transcriptions below. I might make them someday, but feel free to experiment and let me know how things go in the comments. TAke to a gallon of wine, three ounces of cinamon, two ounces of slic’t ginger, a quarter of an ounce of cloves, an ounce of mace, twenty corns of pepper, an ounce of nutmegs, three pound of sugar, and two quarts of cream. Take to a pottle of wine an ounce of cinamon, an ounce of ginger, an ounce of nutmegs, a quarter of an ounce of cloves, seven corns of pepper, a handfull of rosemary flowers, and two pound of sugar. Robert May, The accomplisht cook, or The art and mystery of cookery. Wherein the whole art is revealed in a more easie and perfect method, then hath been publisht in any language. Expert and ready wayes for the dressing of all sorts of flesh, fowl, and fish; the raising of pastes; the best directions for all manner of kickshaws, and the most poinant sauces; with the tearms of carving and sewing. An exact account of all dishes for the season; with other a la mode curiosities. Together with the lively illustrations of such necessary figures as are referred to practice. / Approved by the fifty years experience and industry of Robert May, in his attendance on several persons of honour. (London: Printed by R.W. for Nath. Brooke, at the sign of the Angel in Cornhill, 1660), Wing M1391. Photo courtesy of the Kislak Center for Special Collections, Rare Books, and Manuscripts. (T3r). 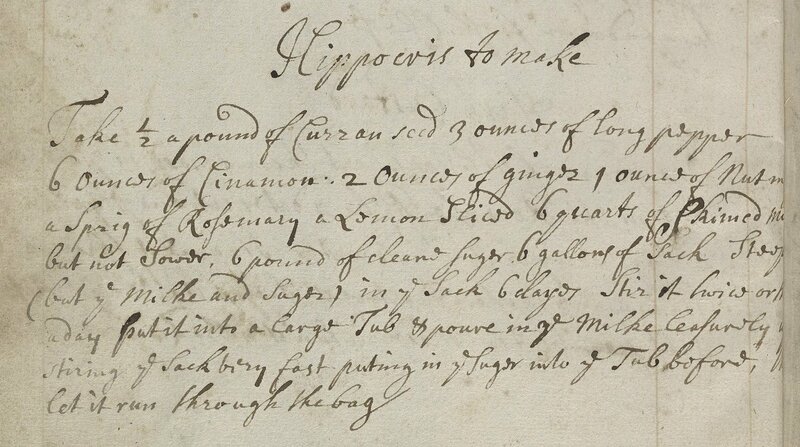 I decided to follow May’s instructions for “Otherwayes … To make Ipocras.” As I show below (and you can see above in May’s first recipe), many Hippocras recipes are intended for white wine, add sack, or use milk or cream during the straining process. May’s “Otherwayes” showcases the characteristics of the original wine as well as the added spices. Combine the wine, spices, and sugar (if using). Cover tightly and let infuse at room temperature for 24 hours before you plan to serve it. Strain out spices before serving using a metal or cloth strainer. The first scent that reaches my nose is rosemary, then cinnamon, then the aroma of the wine itself. The cloves, pepper, and nutmeg all appear in the first sip. Within hours of first pouring it, the hippocras was all gone. The neighbors that stopped in to taste it loved it. One likened it to a brandy cocktail. Another thought the spice flavors were similar to Charoset, the fruit paste from the Passover seder. We all preferred the unsweetened hippocras. In this, we are probably unlike May’s original audience who had quite a sweet-tooth. 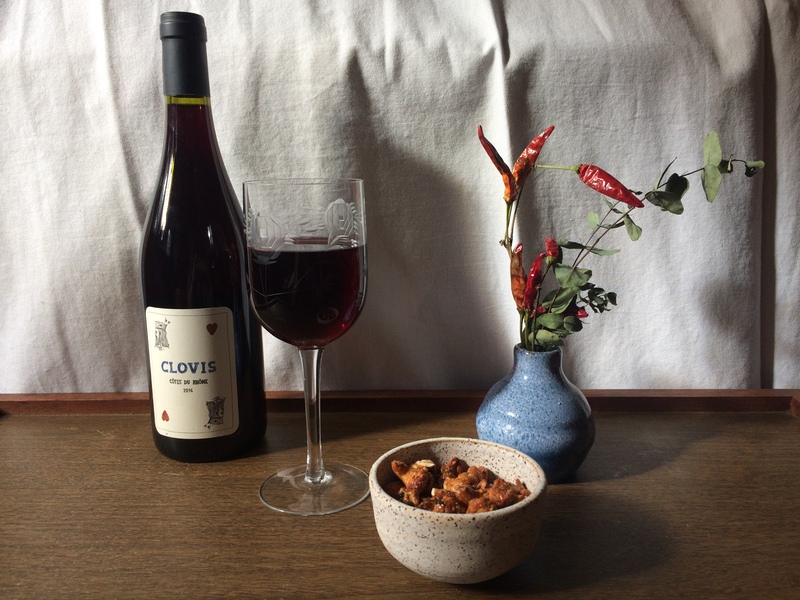 May’s recipe adds the flavors of spice and sweetness to red wine. Other Hippocras recipes take a range of approaches. I’ve also recently tested Mary Baumfylde’s recipe for White Hippocras from Folger V.a.456 for another essay I’m working on. This recipe uses a “milk punch” method to clarify and strain the hippocras. After the initial infusion, milk is added. It curdles and the curdled milk solids are strained out along with the spices. This made a very tasty drink, but I could not taste any of the characteristics of the wine at the base. These hippocras recipes below are all promising, but all showcase fewer of the original wine’s characteristics due to the addition of lemon juice, other alcohol such as sack, or milk. This white wine and sack Hypocrass is from Elisabeth Hawar’s recipe book now held at the Clark Library in fMS.1975.003. It is likely that Elisabeth, or another owner, lived in East London as the book includes manuscript directions to places in Shoreditch and Spitalfields. This recipe from Judith Bedingfield’s manuscript at UPenn (Ms. Codex 631) is driven by orange flavors, includes apples (pippen), and uses the milk punch method. The wine infuses with the sweetness and the spices and once the milk is added it curdles. When the curdled solids are removed, the mixture is clarified and flavorful. Alternatively, this recipe from UPenn LJS 165 uses all sack, a sweet wine from Spain or Portugal and precursor to modern sherry. 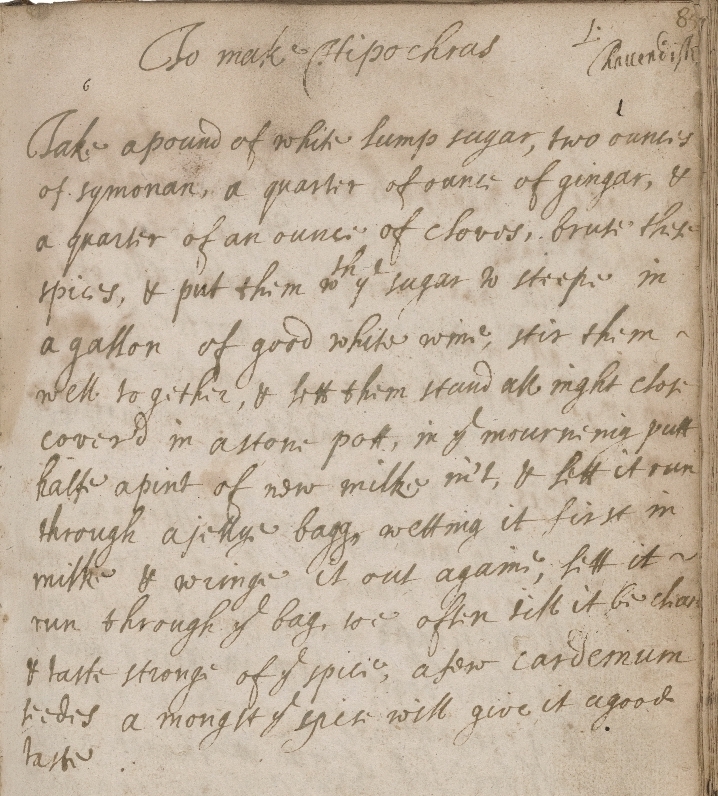 Lady Grace Castleton’s recipe book Folger Ms. V.a.600 includes a receipt “To make Hipochras” from a “Lady Cauendishe.” This version includes cardamon and, like the previous examples, starts with white wine and is strained with milk. Hippocras took many forms. 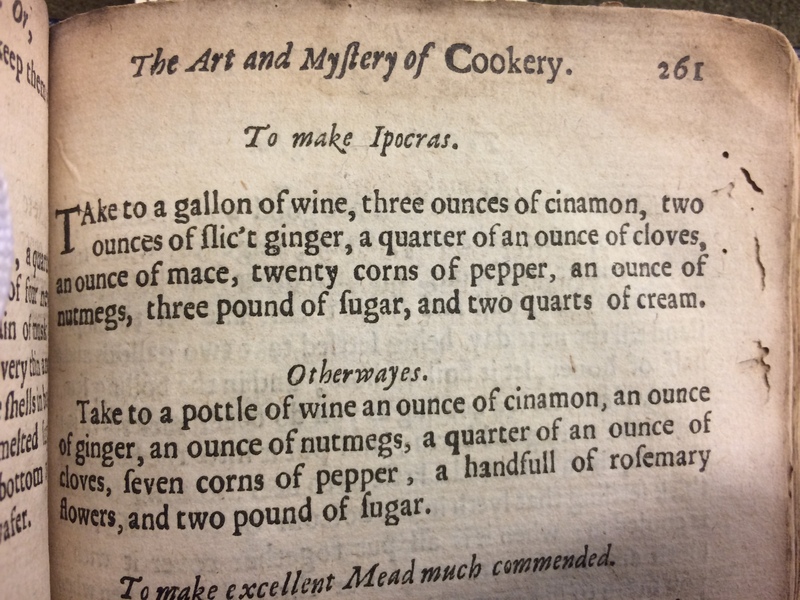 Enlivened with spices and fruit, enhanced with strong sack, or tempered with dairy, Hippocras recipes were designed to healthfully and deliciously amend premodern wines. Despite what Lukacs and others suggest about early modern cooks using spices to amend spoiled wines, the Castleton and Bedingfield recipes insist on starting with good wines. That way, the resulting spiced wines will be as delicious and efficacious as possible. Special thanks to Daniel Veraldi and T. Edward Wines for supplying the Clovis 2016 Côtes du Rhône.